Sunday October 4th was National Grandparents’ Day. Apparently it was introduced to the UK in 1990 by the charity Age Concern, although I have to admit we’ve never celebrated it in our family. I’d like to think we have grandparents’ day most weeks! Lovely Old Lion by Julia Jarman and Susan Varley aims to explain Alzheimer’s in a gentle way. Using the picture book trait of anthropomorphism – using animals to convey truths in a less direct way – it tells the story of King Lion, once kingly and now forgetting things. The words are as carefully chosen as the pictures have been drawn – Grandma explains to Lenny that Grandpa is not himself anymore – which leaves the young cub wondering who he is. It’s a deep and meaningful way of exploring this sensitive topic with young children. The choice of animal is obvious and clever – the once kingly animal, now reduced, most particularly in other’s eyes. Humiliation is a key theme, Lenny sticking up for his grandfather when he is laughed at by other animals. The other elderly animals help Lenny to understand what’s happening and also to be creative in helping King Lion to remember happy things from his childhood. Towards the end of the book the authors introduce the idea of transience – passing things down through generations as King Lion hands over his crown as the sun sets in the distance. The very last page indicates that King Lion has died, but that what lives on is memory – and of course respect and love for those elderly animals who are still around. Susan Varley is also the author of Badger’s Parting Gift, which is a fabulous picture book for those grieving for a dead grandparent. You can buy Lovely Old Lion here. 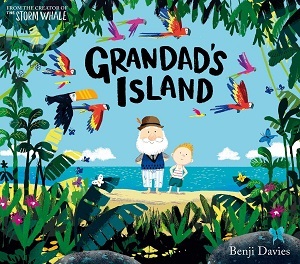 Grandad’s Island by Benji Davies also displays the love and affection of a grandparent for their grandchild, and vice versa, as well as dealing with the inevitability of death. Syd and his Grandad have a wonderful relationship, established by the fact that Syd can let himself into Grandad’s house whenever he likes. They embark upon an adventure together when Grandad’s house magically turns into a tall ship, and they land on a tropical island where they explore the wonders within. From the cover, this book beckons the reader with an intense vibrancy of colour and detail, demanding to be explored. Benji Davies always sets his mood with deliberation and tenderness, from The Storm Whale to On Sudden Hill, and this is no different. The landscape of Grandad’s house is suburban England, a beautiful image of a garden with a terrace of houses in the background. Each illustration in the book shows stunning perspective – from the image of the garden with flowers at the forefront of the picture, and the garden with bicycle against the wall at one step removed, then further back to the house and shed, and then the terraces greyed out still further behind. And when Grandad and Syd build their treehouse on the island, the reader feels as if they are peeking through the foliage to view it. But it’s the little details that shape the book too – before a voyage is mentioned, the reader can spy a model lighthouse through the window of the house; the attic abounds with treasures from long ago reflecting Grandad’s age, including a gramophone, which also makes its way to the island; Syd holds his nose in a perfect childlike gesture when he jumps from a waterfall; the leaves on the tree on the island are actually held by ants. Other imagery is stunning – the “ocean of rooftops” – lyrical in text but perfected in illustration as the water blends into the tiled roofs. Davies brings humour in abundance too, from the play on words ‘they soon had everything shipshape’, to the orang-utan bringing a tray of drinks, and Grandad’s youthful glee. At the end the island becomes a paradise with Grandad’s belongings embedded in the jungle, and Grandad reveals that he has to stay behind. Syd travels home alone, but is lifted from his sadness and loneliness by a surprise delivery. As in Lovely Old Lion, the lasting image is that people live on in memories. It’s certainly one of the most memorable books I’ve read in ages. Purchase it here.